Labrador’s Ryan Davey has claimed his second Grogan Medal in three years, claiming the QAFL’s highest individual footballing honour on Monday night. Davey, who shared the medal with two others in 2012, was a sole winner this time around, finishing with 26 votes, eight votes clear of Palm Beach’s Jesse Derrick, despite missing seven home and away matches. Morningside’s Paul Shelton finished third with 15 votes, ahead of Mt Gravatt captain, Joe Murphy, and his Panthers co-captain, Tyson Upton, both on 13. It was déjà vu for the 28 year-old, whose 2014 season has followed an eerily similar pattern to that of 2012, with a foot injury suffered at Mt Gravatt’s Dittmer Park keeping him out for lengthy stints in both seasons. Davey was a clear standout for the umpires, polling votes in every match he played, including top votes in six matches. By the time of his injury, Davey was a runaway leader in the count, 13 votes clear of Derrick at the end of Rd 14, making him unassailable with four matches left. Davey’s standout qualities were not missed by the QAFL coaches, either, with the 28 year-old winning the Syd Guildford Trophy, 13 votes clear of Shelton. The midfielder’s double win is the third since the Trophy’s inception, after Matthew Payne in 2006 and Nathan Gilliland in 2009. Palm Beach’s Brad Scheer, the QAFL’s youngest player, claimed the Rising Star award, in a close count, on 22 votes, three ahead of Morningside’s Rhys Power. Broadbeach’s Taylor Haley won the Ray Hughson Medal, as the QAFL’s leading goal kicker, with 61 goals in the home and away season. Morningside lead all comers in the QAFL team of the year, with seven representatives in the side, with Paul Shelton, Nathan Kinch, Nick Tomlinson, Kent Abey, Matthew Logan, Peter Mollison, and Tyson Upton all included. Davey was named at rover in the team, one of four Labrador representatives, along with Kurt NIklaus, Tom Daniel and Simon Seddon while Palm Beach had Derrick, Todd Bryant and Josh Woolley in the team. Wilston Grange duo, Matt Trewhella and Steve Brittain flew the Gorillas’ flag in the QAFL’s top 22, while Mt Gravatt also boasted two inclusions, with Joe Murphy and Adam Boon in the side. Haley was the sole Broadbeach representative, while Michael Stewart (University of Queensland) , Cassidy Haberfield (Surfers Paradise) and Ben Jaenke-Cain (Western Magpies) were all recognised for impressive seasons. Morningside had their fair share of winners on the night, with David Lake taking out coach of the year, and the Panthers winning the Alpha Sport Club of the Year gong, for their on and off-field conduct. Ryan Downes was the standout whistle blower of the year, winning the QAFL Umpire of the Year award. For the first time, the QAFL shared the spotlight with the Queensland Women’s Australian Football League (QWAFL) awards, highlighting some of Queensland’s top female footballers. Coorparoo’s Emma Zielke continued a fairy tale season, clinching a dramatic QWAFL count, by just one vote. It took the 2014 Melbourne draftee until the final round of the season to take the outright lead, with top votes in the Navy Roos’ match against Wilston Grange, as she pipped Yeronga’s Jordan Zanchetta at the post. Her teammate, Maddie Protheroe, won the leading goal kicker award, with 53 goals. Coolangatta’s Maddy Roberts was crowned the QWAFL rising star, after impressing in just her first season of AFL. Coorparoo dominated the QWAFL team of the year, with six representatives in the team, while Zillmere and Yeronga were the next best, with four each. Zillmere’s Jacob Simmons-Bliss won QWAFL coach of the year, after taking the Eagles to a grand final. Wilston Grange’s Brett Gillett won the state volunteer of the year and QAFl Administrator fo the year, while the Western Magpies’ Tony McDonald won QAFL volunteer of the year. 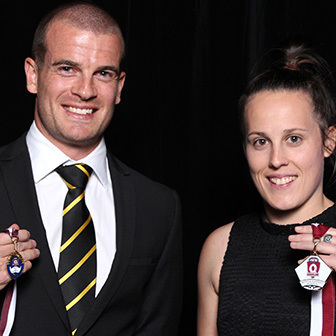 AFL Darling Downs’ Heather Green was awarded the inaugural Queensland Football Woman of the year and Dr Mark Gregg was recognised with an AFL merit award.